Guests may choose which tour they wish to participate in. Due to capacity limitations, pre-booking is required to participate in a distillery tour. Tour the Jim Beam Distillery at the Jim Beam American Stillhouse, where they believe secrets are for strangers and treat all of their guests like family. Get a look at how their bourbon is made with a guided tour that walks guests through the entire process from their natural limestone water well through the mashing, distilling, barreling, storing and bottling. Then, join Troy Beam in the tasting room for a sample of this iconic American spirit. On the outskirts of lovely, picturesque Bardstown, Kentucky, sits the historic Willett Distillery in the heart of what’s been dubbed the “Bourbon Capital of the World.” This independent, family-owned small-batch distillery has been in operation at its current location since 1936, but its roots go back just after the US Civil War. Our tour will bring us through the main distillery building, cistern room, aging warehouses, and grounds. Sip on samplings of the fine product before concluding in the gift shop! Experience the people, sights and sounds of the state woven together in a high-definition production that will excite your senses and steal your heart. This 32-minute breathtaking, multimedia show explores the ways Kentucky’s past, present and choices for the future converge to create an utterly unique and powerfully engaging place. Kentucky Show! is housed in its own specially designed theater at the Kentucky Science Center, is destined to become one of the major attractions in the state. It’s a first-see for visitors and a must-see for Kentuckians. The show begins at the top of every hour. Choose to spend some time at one of Louisville’s famous Kentucky Show! Located on West Main Street. Experience the people, sights, and sounds of the state in a high-definition production that will keep you just as entertained as you are informed. This multimedia show runs for 32-minutes and explores the ways Kentucky’s past, present, and choices for the future converge to create a unique and engaging destination. This family owned distillery in Louisville is the state’s second largest bourbon distillery. Today, tour the facility and learn about the rich history that makes this distillery so unique to Louisville.After purchasing the Worsham Distillery in Henderson, Kentucky, in 1889, Henry K. Kraver founded the Peerless brand. He and his son-in-law, Roy Taylor Sr., ran the business together, producing about 8 barrels of rye whiskey bourbon per day. Production increased drastically by 1913, when the Kentucky Peerless Distilling Company employs 50 workers and pushes out 10,000 barrels per year. By 1917, the company was running at peak production, producing a staggering 200 barrels per day, more than 23,000 barrels a year, and 63,000 barrels in storage! But in this same year, the 18th Amendment was passed and the era of Prohibition moved in, closing the distillery. After that, the facility fell off the map until Kraver’s great grandson, Corky Taylor, and his son, Carson, bring back the family brand in Louisville, Kentucky, where it resides today! The Wild Turkey Distillery was founded in 1869 and found its name almost a century later when it was taken on a Wild Turkey hunting trip and the name was born. Enjoy a guided tour of the production facility including the distillery, cistern room, bottling and packaging center and warehouse. At the conclusion of the tour, enjoy a tasting of the spirit and bring a complimentary tasting glass or purchase a bottle of Wild Turkey to bring home with you as a reminder of your visit. INSIDE THE BOURBON EXPERIENCE – Learn what makes a centuries-old tradition as uniquely American as our river cruises with this rare opportunity to experience an extraordinary journey through America’s Heartland and into the roots of Kentucky’s bourbon region. This special themed voyage will take you behind the scenes and into the history books to show you where bourbon comes from, how it is made and the ways to distinguish the unique characteristics of different distilleries. Not only have we arranged for special tastings, treats, and cooking demonstrations, but also we are thrilled to announce an exclusive line-up of special onboard guests. Bill Samuels Jr., son of Maker’s Mark founder, Bill Samuels Sr., will lead a Maker’s Mark presentation and tasting. Also joining Bill Samuels will be Don Flinn of Buffalo Trace whose presentations and tastings have received rave reviews on our past Bourbon cruises. Michael Veach, a bourbon historian and member of the Kentucky Bourbon Hall of Fame, brings an unbiased opinion to any bourbon conversation and will offer tastings of some of the world’s most famous and unique bourbons. Both onboard and ashore, each day presents an eclectic blend of music, creative workshops and a wealth of enrichment that can’t be found anywhere else. 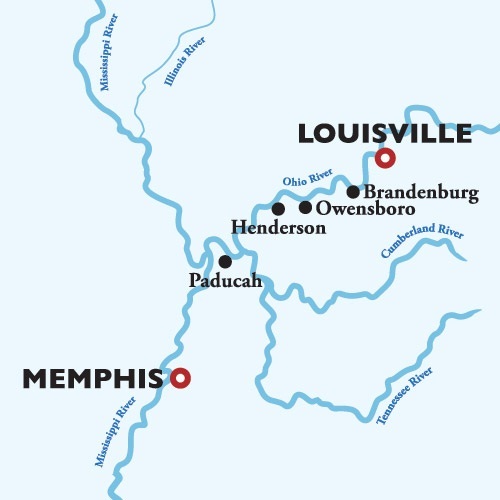 This dynamic blend of historic discovery, toe-tapping entertainment and complimentary tours of the finest bourbon distilleries creates a uniquely American river cruise that you simply cannot afford to miss!